WASHINGTON (CN) – Before the Senate confirmed Tom Price as secretary of health and human services, an election-law group claims, the Georgia Republican’s campaign committee made improper donations to a conservative political group that supported his nomination. Filed Friday with the Federal Election Commission, the 8-page complaint by the Campaign Legal Center says the conservative political group America Rising began running videos and conducting research to support Price’s nomination after his campaign committee, Price for Congress, sent it $40,000 on Jan. 26. 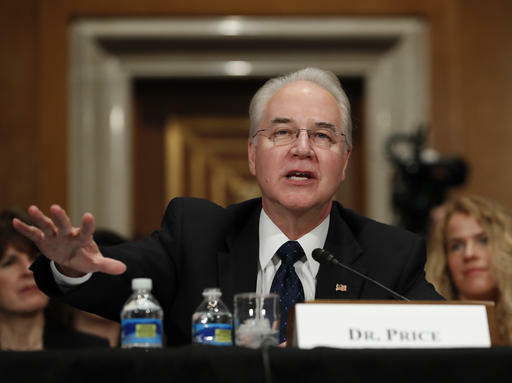 Less than a week after the contribution, the Senate Health, Education, Labor and Pensions Committee approved Price’s nomination to lead the Department of Health and Human Services, and the full Senate approved him on Feb. 10. “Price for Congress’ payments to America Rising were not related to Price’s re-election campaign in Georgia’s sixth congressional district, nor were the payments in any way connected to Price’s duties as a federal officeholder – meaning, under commission regulations, his duties as a member of Congress,” the complaint states. Federal election law prohibits candidates from using campaign money for their “personal use,” which the Campaign Legal Center says Price’s payment to America Rising clearly was. The complaint points to reporting by Slate this month that three other cabinet nominees donated to America Rising around the time of their confirmations, though Price was the only one to use money from his campaign committee to do so. “In effect, Price for Congress paying $40,000 to America Rising amounted to the use of campaign funds to help Rep. Price get his next job,” the complaint states. The complaint, filed by Campaign Legal Center attorney Brendan Fischer, asks the FEC to start an investigation, which could result in sanctions against Price’s campaign committee. The Campaign Legal Center is joined in the complaint by Democracy 21, a nonprofit that works for campaign-finance reform. The Department of Health and Human Services did not respond to a request for comment on the complaint.